The Labyrinth is an ancient archetypal symbol of wholeness that has been found across Countries and Cultures the World over. The oldest known Labyrinth appears in petroglyphs in Spain dating around Four thousand years ago. They have been found on coins in Crete, laid out with rocks in Northern Europe, painted on bark in Indonesia and carved in to rocks. There are numerous labyrinth designs however the classical 7 circuit ‘seed pattern’ at the top of the page is the most ancient perhaps ‘original’ design and found world wide. 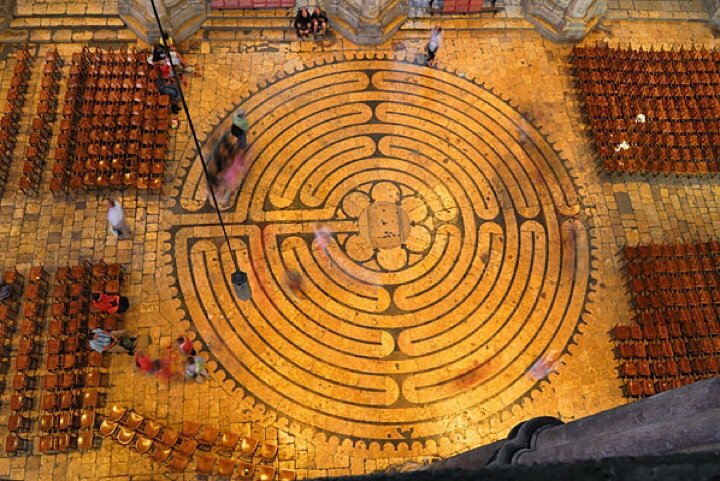 Chartres Cathedral Labyrinth, France, (Above). One of the popular Labyrinth Designs today was laid in the early 13th Centuary 1200-1220 CE, It can still be walked at certain times of the year. Benefits include:- Reduces stress, Balances left and right hemispheres of the brain, Balancing male/female energies, calming, relaxes the body, frees the mind, promotes body awareness, develops intuition. I am available for workshops, walks, talks and labyrinth builds. just get in touch if you have an event or project you wish to discuss. My passion is with nature connection and that is primarily how I work with the labyrinth. You can learn more about this work and deeper concepts in the book, ‘Re-wilding with the labyrinth’. Here are some examples of the labyrinths I’ve created to date. Nature connection is always at the forefront of this process. A conversation with the land, spirits, plants, elements and beings of the place happens throughout and often starts a couple of weeks prior to even seeing the site. 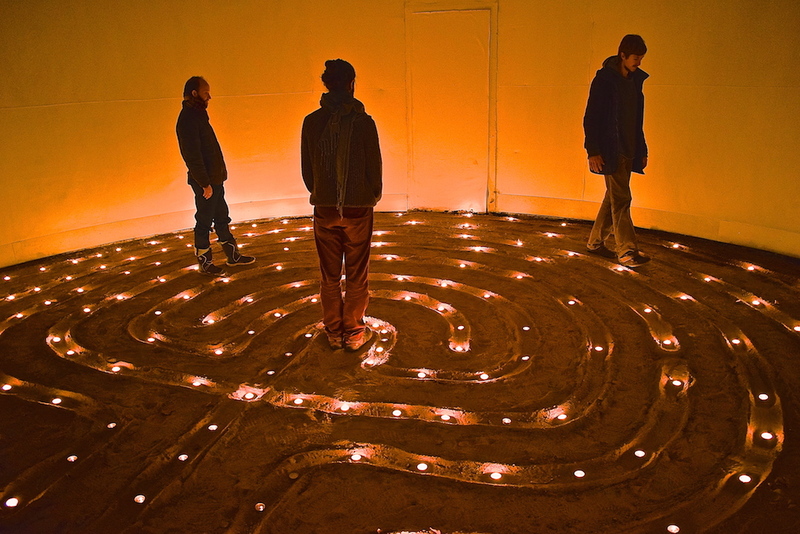 The image below is a 7 circuit classical design labyrinth built for the Hermitage, a part of 42 acres retreat centre in Frome, Somerset. You can read more about this labyrinth under the Labyrinth builds menu (Hermitage Labyrinth) The stone is a local Somerset stone, which was residing up in the woods behind the courtyard. A week or so later I was told that the stone had once stood in the form of an old outbuilding just behind the railings above the back wall, right in line with the labyrinth. I love the fact that the stone has come back in the form of this sacred shape in such a prominent part of the courtyard. The stone too has a dream to share when we are still long enough to listen. Below: This was a private commission in Wick, near to Langport, Somerset, UK. To read more about this build follow the link to (Langport Labyrinth) and you can also view details if you wish visit the labyrinth on the labyrinth locator website at https://labyrinthlocator.com/home.